An overwhelming majority of Americans think that they are heaven-bound. 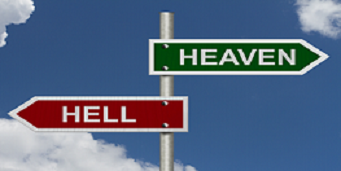 Nearly two-thirds of Americans in a national survey said that they believe they will go to heaven, according to Barna Research Group, an independent market research firm which has tracked trends related to beliefs, values and behaviors since 1984. “We’re optimists at heart,” theologian Robert Johnston, professor of theology and culture at Fuller Theological Seminary in Pasadena, said, commenting on the survey’s results. Even in India where the Gita is fairly well-known, many miss the essential point about the Kuruksetra war. Krishna tells Arjuna that he is a warrior and his duty is to fight. As the Supreme Lord Krishna personally had arranged this fight and also sanctioned it, it was a “religious fight” in its truest sense. It was not about political diplomats declaring war while keeping the people in ignorance. Today’s politicians follow the dictum “Trouble at home, war abroad.” When they cannot manage the economy properly, they engage people in war to divert their attention. But war is not meant for that purpose. If a king is not treating its citizens properly or not training them in spiritual culture, another progressive king may attack the kingdom. The Vedas point out that people in general are not very intelligent, and due to their ignorance, they are most attached to things that give quick results. Those parts of the Vedas which mention such rituals and guarantee those fruits are called karmakanda. The essence of heavenly life as mentioned in these portions is ample availability of wine and women – that’s all. Vedic experts, however, point out that to consider this as the essence of all Vedas is to miss the point altogether. The Gita actually describes how even the so-called enjoyment on heaven is a temporary state. Once the stock of pious credits is over, the enjoyer is unceremoniously thrown down back to this world, just as a bouncer kicks out a reveller from a bar or a casino once his money runs out. Instead of this paltry and temporary heavenly existence, Krishna has his own planet called Vaikunöha-loka or Krishna -loka, which is described as eternal. That eternal heaven is the real goal for all intelligent beings.